The Start of the Palace Collection for 2008. Swarovski Crystal Pendant (38mm) to hang from leather necklace. Retail Price $ 198 US dollars. The 2008 Extrait de Parfum has been called Superstar deluxe and has also been called the 2009 Extrait de Parfum, but I think this is the 2008 limited edition. I assume this is because the large production of 5,385 bottles made it hard to sell off in 2008 and they included it in the 2009 Palace issue? 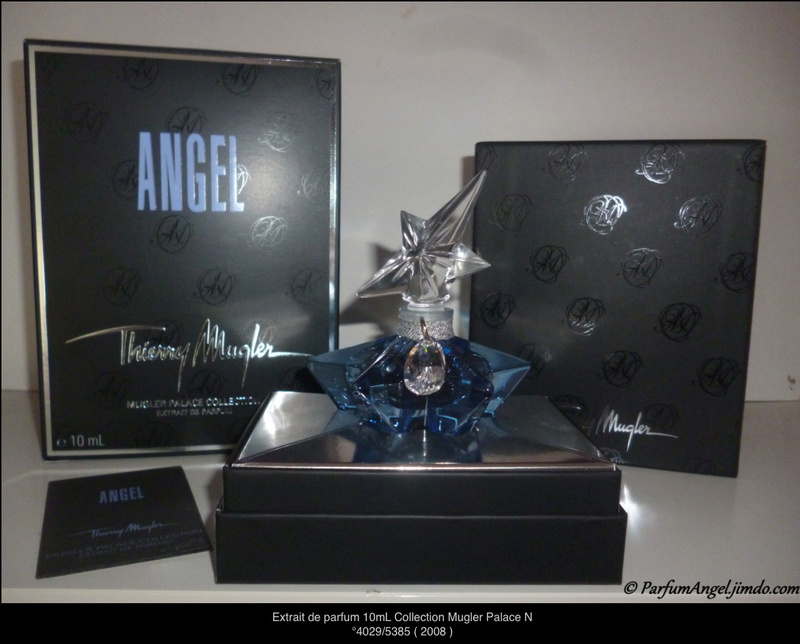 The photo of the box below showcases the name of the perfume as Mugler Palace Collection, Extrait de Parfum, so that is technically it. 2013 Excessive Star (Both these 2013 are almost identical). All these are very nice bottles, but I wish the stoppers would have varied somewhat among them and not only the base. This bottle has a slight blue coloration to the base glass of the bottle, similar to 2003 Mystic Star’s purple haze. Filled with Eau de Parfum EXTRAIT .33oz, it retailed for $198. 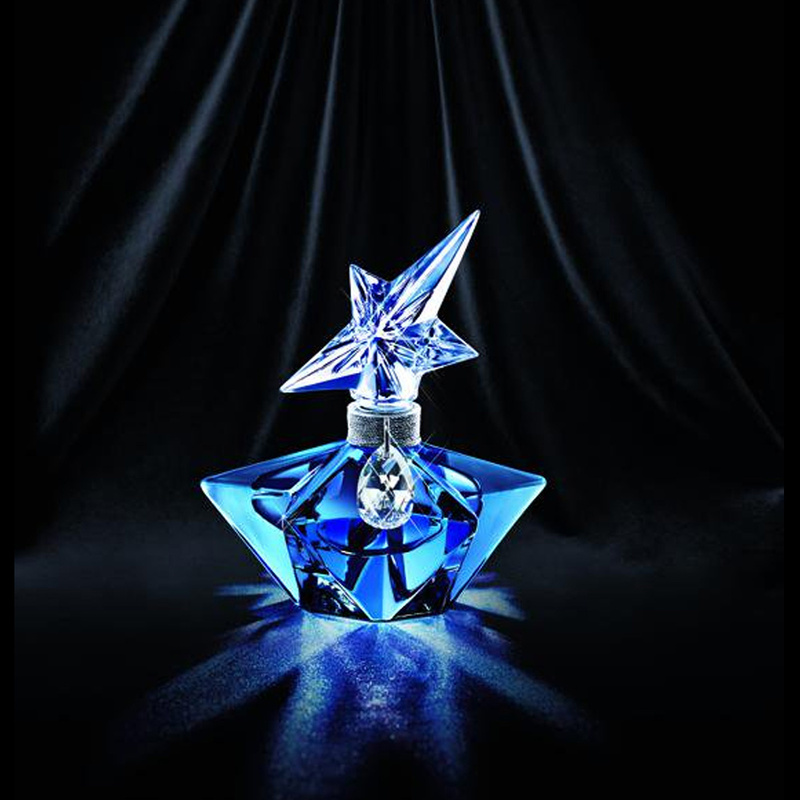 This Mugler Palace Collection Extrait de Parfum “Superstar Deluxe” as I have seen it called brings a silver string wrapped around the lower part of the neck of the bottle and hanging from it is a nice large 38mm tall Swarovski Crystal that can be hanged from an included leather necklace. 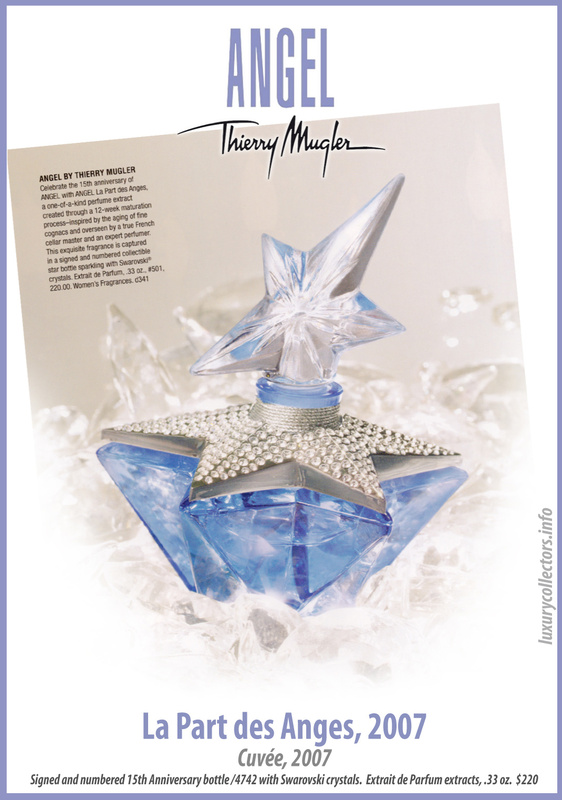 Photos of Thierry Mugler’s Extrait de Parfum Bottle. The main focus of this bottle is the large oval shaped Swarovski crystal that can be hanged from a leather necklace. 2009 Superstar deluxe (with Swarovski crystals adorning bottle and the pendant. These three bottles will be further explained in the next page. 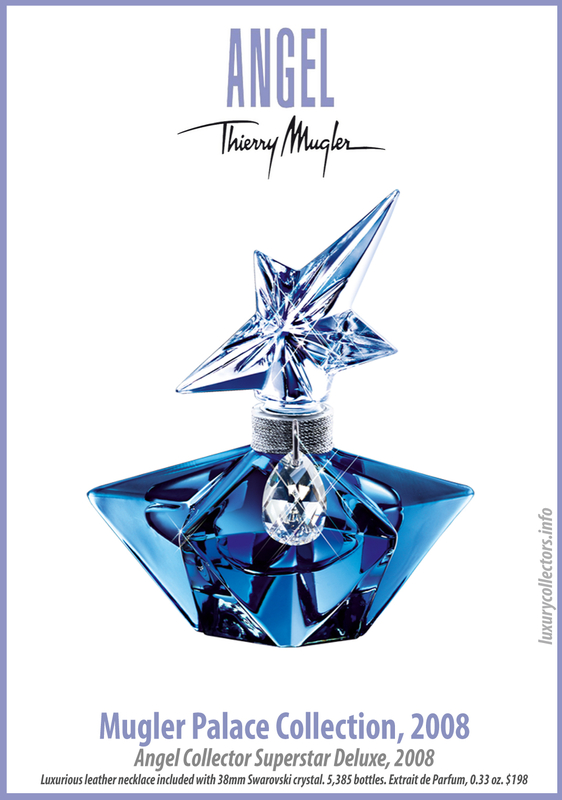 Advertisements of Thierry Mugler’s Extrait de Parfume Bottle. 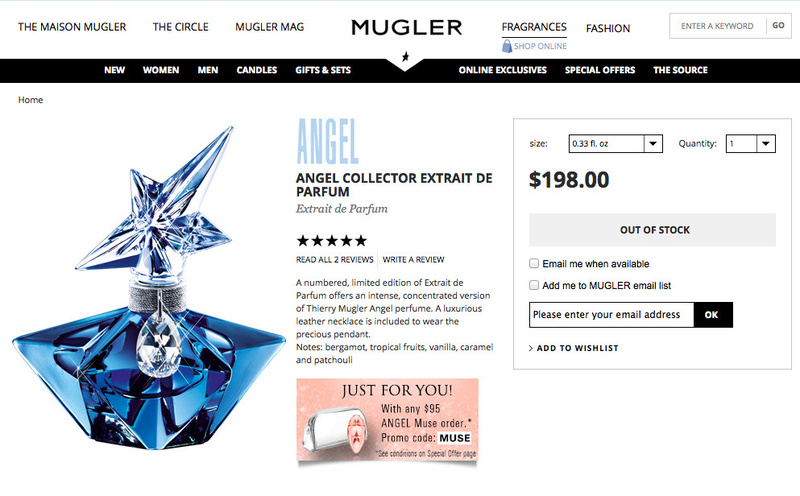 Screenshot from Mugler.com parfums, years after the 2008 original production. Photos of Thierry Mugler’s Palace Collection Box Presentation. The box for this issue has the name MUGLER PALACE COLLECTION on the front with Extrait de Parfum as the second title. I can quite make out the logo against the black background, which usually simbolizes 10 year anniversary, but this would be a 16 to 17 year anniversary? Another great photo from parfumangel.jimdo.com shows the pendant and the label on the box. Another photo of the packaging of this bottle.